Anyone who knows me knows that I love decorating, designing, and customizing anything and everything I possibly can. I started my new job back in January and I swear one of the most exciting parts of starting my new job was decorating my desk area. It took everything in me not to bring my box of office decor the first day (I waited until day 2, ha!) so people wouldn't think I'm totally crazy. 1.ban.do - Lady of Leisure 12 Mo. Planner. My planner is like my bible and I carry it with me everywhere. I had a ban.do planner last year that I absolutely loved! When you open this up, each two page spread breaks down the months by weeks with tons of space in each day to write down everything you need and also has monthly calendars too. And it comes with stickers!! 2. Etsy - There's A Chance This Is Vodka mug. Only $12! I am OBSESSED with this mug!! My best friend got me a very similar one (same saying, different color) for my birthday a few years ago which was right when I started my first big girl job and it is perfect! 3. Dormify - No Bad Days Print. Your desk won't be complete until you have a (slightly) cheesy motivational print/poster. I love this simple message paired with the pop of color. I want this! 4. Urban Outfitters - Electroplated Scissors. I don't think I've ever seen such a pretty pair of scissors before. Love these! Urban Outfitters always randomly has a really cool selection of apartment decor/office stuff, just a tip! 6. S'Well - Palm Beach Water Bottle. I am obsessed with this design!! I've linked a S'well water bottle in my Father's Day Gift Guide but you need one for yourself to keep at your desk, obviously! 7. He Said She Said - 'Girl Boss' Nameplate. Of course you need some motivational decor on your desk. I found a similar one at TJ Maxx that I have at my desk! I love it. 8. Kate Spade - 'Tackle Box'. Normally $36 but I found it on sale for $25! This stationary set is packed in a transparent divided box that is perfect for display and organization. This set includes an adorable assortment of paper, sticky notes, push pins, clips, tape, an eraser, 3 pencils, and a small sharpener. 9. Umbra Trigon - Bulletin Board. I love bulletin boards because they're a great and easy way to create and customize your own collage/vision board. This bulletin board has a fun geometric shape background so even if all the space is not covered it still looks cute. I would put up picture, concert tickets, movie stubs, and post cards on mine! 10. Color Pop - Stapler. ON SALE! ONLY $7! Sometimes switching out your mundane desk accessories for a cuter version give your desk the transformation it needs. This mint color is so pretty! 11. Color Pop - Tape Dispenser. Only $12!! This is the same brand as the stapler - they come in a handful of other really pretty colors! I love the block-y modern look of these office accessories. 12. Botanical 2018 Appointment Calendar. Personally, my planner is not enough for me when it comes to calendars and organization. I like to have a big calendar hung up right in front of me to keep track of big upcoming meetings, travel plans, pay periods, etc. 13. Caitlin Gold Magazine Holder. On clearance!!! A magazine holder was a great purchase for me because it's turned into an absolute necessity to keeping my desk clean and organized. I keep random printouts, folders and notebooks in here and this is where I put my planner and any loose papers in before I leave at the end of the day to keep my desk clean! 14. Rosanna - 'Let's Chat' Business Card Holder. I am obsessed with this business card holder!! I don't know if you can see all the details in the small picture but it has the retro rotary dial telephone and on the front in cursive it says 'Let's Chat'. So cute! I love the extra touch of having a business card holder on my desk. It's kind of motivating to have your business card with your official title and such displayed in front of you as you are working. 15. Wallpops - Dry Erase Peel & Stick Vinyl Decals. These would not only serve purpose at your desk area but also look really cute! Jot down some miscellaneous notes, important upcoming meetings, PTO announcements, etc! 16. Faux Peony Arrangement. Get the look of a gorgeous peony arrangement for less! If I had it up to me I would have fresh flowers at my desk and in my apartment every day. Since this will never happen, I think getting a pretty (but fake) arrangement still does the trick at your desk. 17. Anthropologie - File Folders. How cute are these??? There is literally nothing more boring than plain manila folders. I have a similar set of these folders that I keep important documents I need filed at home (apartment stuff, bills, birth certificates, Ollie's vet documents, etc.) and it really does make all the difference. 18. Threshold - Pink and Gold Mousepad. This is the same exact one I have on my desk! I love it and I get compliments all the time! The mouse pads that you get from work are usually SUCH an eyesore. This was on the top of my list of items to buy for my desk! 19. Kate Spade - Pencil Cup. I love this pencil cup holder to keep all your pens, highlighters, scissors, etc. Hack: If you don't want to spend any money on a pencil holder use one of your cute candles you have in your house! Put the used up candle in your freezer, keep it there for a few hours, and when it's hardened stick a knife in there to break up the remaining wax. The wax should come out super easily and voila - a perfectly good pen holder. This is what I did at my desk! 20. Umbra - Pinch Photo Display. This is another cute way to display some photos, postcards, or whatever around your desk/cube area! Way cuter than push pins. 21. Era Home Marble Picture Frame. I love all the bulletin board collages and push pin methods of displaying pictures but I also love the look of a nice picture frame on a desk. This marble frame is so gorgeous and only $24! Perfect frame to display your family, best friend, boo thaaang, or pet! 22. U Brands - Desktop Letter Tray. This is another very practical item to have at your desk! My letter tray is a stack of contracts I need to file, documents I need to look at, etc. This particular letter tray would match PERFECTLY with the magazine holder in #13! 23. Dormify - Tall Task Lamp. Having a lamp at your desk can really come in handy. It may not ever be dark at work but sometimes the lighting isn't as bright as it should be without you realizing it and typing all day, reading documents, etc could be straining your eyes without you even knowing it! This lamp comes in several different colors. I also like the yellow one! 24. Frisco Desk Organizer. Only $10!! This is a perfect desk accessory to store miscellaneous items such as post it notes, binder clips, lotion, etc! This also comes in a handful of other colors. 25. Vinea - Wastecan. Another office eyesore are the garbage cans. You can have the cutest desk set up in the world but have it all be ruined by ugly and bulky garbage can that comes with your desk. Complete your desk makeover with the final touch of a pretty waste can. Great selection! Love the planner! I need that tape dispenser! Soooo adorable! Home office goals right here! Agreed! I want 'em all! I love these products! You always give me ideas to spend money hahaha. I'm looking for a new planner. But there are so many options I can't choose! The number 2 mug is so funny ! Perfect for any birthday present ! Haha yesss!! It is still one of my favorite gifts! I love anything to do with stationary. Thanks for the post cos now i definitely what a look out for some faux peonies arrangement. Love this! These cute desk accessories makes work more fun! OMG i love awesome office supplies like this! it makes the work day so much more bearable! oh boy - I could probably take some notes from this post hahahaha. My desk looks like an absolute train wreck. On the plus side, my assistant's is just as bad - so at least I know we're a good team hahaha. Love these picks! I definitely need to revamp my office space! Thanks, Kalina!! Same with me! How amazing is this post! Seriously, I am a big fan of stationeries. Just feel like when you have them you can work on anything happily!!! What beautiful picks, thanks for all the ideas!! Aw, thanks Rosanna!! You too! I'm more of an organized mess ;) But I totally agree - cute office stuff and organization makes work (or school!) so much easier! Everything is so cute. I can buy office stuff non stop haha. I love redecorating my work space. All of these stuffs are so cute! I personally love the writings on no 2 cup, no 6 bottle and no 17 mousepad. All of these could be my favorite tho, since I like pink and all of these are mostly in pink. Great choices dear! 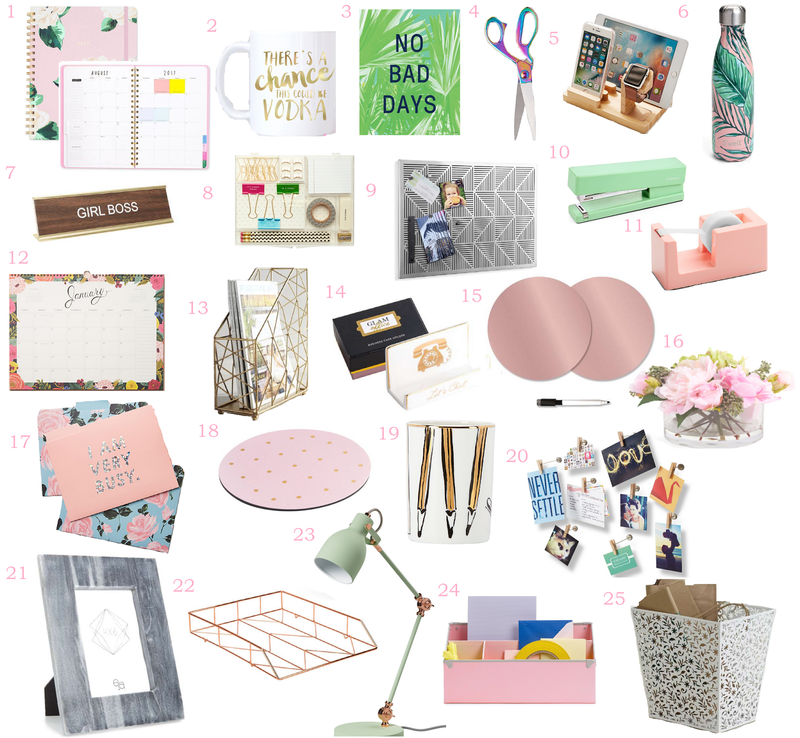 These office supplies are so cute, I think we all work better when our office looks super cute! Haha! It looks like we have the same weakness! I could seriously spend all my money on home/office decor - it is so dangerous!! I love everything!! It's always nice to jazz up the office! SO cute! I LOVE new office supplies! this is such a great selection!!! I definetly Need to update my Office. Since I work from home, my place is a total mess. Oh my! I love all these cute office pieces to make our workplace even cuter! Yesssss!! That palm print is one of my faves in this whole post! ouhhhh! love all of those! Omg I'm in love with everything! I love office accessories and always want to buy everything, but there's no space left in my room or on my desk haha. Haha I can totally relate to this!! I love all your picks!! Ummm I think I need all of this pls & thx. You must give careful consideration to meetings before you get started - so use meeting space San Francisco or cabin in your own office to talk with your colleagues about how you intend to go about meeting your goals.